Making a website can be as simple or as complicated as you’d like, but getting the right domain name and hosting services can be a bit harder. I used to dabble running my own website when I was a teenager so I know it can be costly and headache inducing sometimes. We’ve teamed up with Arvixe Webhosting services and we have an exclusive code to save you 10% off your entire life-long plan, meaning that as long as you have the plan, you save! I’ve also conveniently placed this code on our main Arvixe coupon page where you can find other offers too. 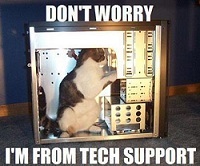 ~ I can guarantee you that the technicians at Arvixe are human and not cats! There are multiple categories with different packages to best suit your needs, ranging from personal to business needs and more. At first glance the personal class seemed to be well priced from my experience. There are a few big things I noticed that came with the personal package that instantly caught my eye; the first one being the unlimited disk space and unlimited transfers. These features allow for easy and cheap scaling, something most of their competitors don’t offer for free. Their bonus of a free domain name for life is also a highlighted offer, usually customers have to pay for the name plus renewal fees. The total price for a personal package is fairly reasonable at a rate of $60 a year. It’s worth noting that the 10% offer is valid no matter which payment method you use.